Becoming debt-free is an important goal and a significant financial milestone. To some, it might feel out of reach, and to others it might be just around the corner. In some cases, becoming free of credit card debt is the primary goal, and in other cases it’s medical bills, a car payment, or a mortgage. At Clearpoint, we want you to rid yourself of bad debt (like credit cards) and also pay off your mortgage, vehicles, and any other debts in your name. That would really be a debt-free lifestyle, and it’s our hope for everyone. Let’s take a look at how to become debt-free in five simple steps. You may have heard of the terms “good” debt and “bad” debt. This idea is a little controversial, and some conservative financial planners and commentators suggest that no debt is “good.” But in reality, some debt is much less dangerous than others and some is nearly impossible to avoid in the short-term. In this example, opting for a personal loan would save $707 just over the course of one year. When we speak of good debt, we are talking about low interest debt that serves a real purpose and need. Often, credit cards debt only serves one purpose—to fulfill a “want.” For instance, when you go on a shopping spree with credit, you are getting things you want, not things you need. Of course, there are some exceptions to this. Sometimes, people run into credit card debt to pay for medical bills, or other important expenses, and credit feels like the only option. On the other hand, good debt fulfills needs and does so in a safe manner. A mortgage, for example, provides a home (shelter is a “need”) and often does so at reasonable interest rates. In many cases, taking on this debt can be cheaper in the long-run than other “debt-free” options, such as renting. A car payment is similar in the sense that it provides something useful, such as a form of transportation to work every day. And if you have good credit, the rates on auto loans can be pretty good. But most financial experts wouldn’t really classify a car payment as “good” debt, because the price is low enough to the point that you are probably better off saving your money and purchasing vehicles with cash. It’s much less feasible to buy a home with cash. Repaying good debt doesn’t always have to be rushed. There are several cases where it makes more sense to save for retirement or meet other financial obligations instead of paying off “good” low-interest debt in advance. Either way, the first step to becoming debt-free is simply to determine how much good debt and how much bad debt you have. Once you figure this out, you will have a better sense of how to prioritize. And, of course, bad debt will be your focus. After you figure out how much debt you have, you need to calculate how much of your income is being devoted to these debt obligations. This will help you assess how dire your situation really is, and can help determine if your level of debt is really manageable. *Note: Really, a debt-to-income ratio should be based on monthly income and debt payment figures. Learn more about monthly-debt-to-income ratios. To do this, you need to know your debt-to-income ratio. A debt-to-income ratio or dti is a tool used by lenders to determine the level of risk a borrower presents, but it’s useful for all of us. 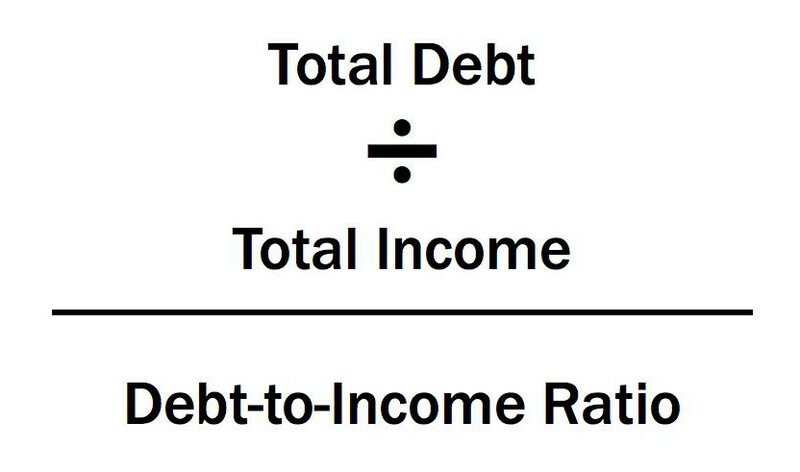 To calculate it, you simply divide your debt by your income and then convert the decimal into a percentage. You can use this calculator to figure your dti conveniently. At a minimum, we recommend that your debt-to-income ratio stay below twenty percent for non-mortgage debt. Really, though, it’s ideal to stay at 15 percent and below. Once you incorporate a mortgage into the figure, financial advisors recommend keeping your total debt-to-income ratio at or below 43 percent. Sometimes, you will hear this referred to as the back-end ratio. The next step to becoming debt-free is to select a repayment method. Your choice will be based on the type of debt you have, along with the status of your debt-to-income ratio. If your dti is over twenty percent, we recommend that you seek credit counseling as your initial repayment strategy. During a credit counseling session, your counselor will do a thorough review of your situation and help identify strategies to spend less. If you and your counselor are able to come up with sufficient ways to cut spending and build a monthly cushion, you might be okay to select a self-pay method for your debt. If not, and your situation continues to be difficult due to high interest credit cards, a debt management program might be the better option. This repayment method is structured, and often comes with unique benefits such as lowered interest rates, which can save you thousands during your repayment. If your debt level is more manageable but you are still dealing with multiple, non-mortgage debts, you will want to choose a self-pay method. The two methods we recommend are the ladder method and the debt snowball. The ladder method prioritizes the high-interest accounts and saves you the most money over time, while the snowball focuses on the smallest balances and creates the most immediate reward as you close accounts. We encourage you to check out our guides on the ladder method and debt snowball, as they can be extremely helpful in your debt-free journey. When you set up your repayment plan, you need to stay organized in various ways. First comes the physical organization. You will need to create a space to keep your mail, bills, and other financial documents. To prevent headache and frustration, you will want to organize these in files and folders for various categories, such as insurance, utility bills, bills from creditors, and so on. You will want to keep a calculator handy too and develop a routine filing system. Doing this can also help ensure that you don’t overlook bills or forget about some of your past financial obligations. And, believe it or not, this doesn’t have to be boring. Check out two of our favorite designs we found on Pinterest. 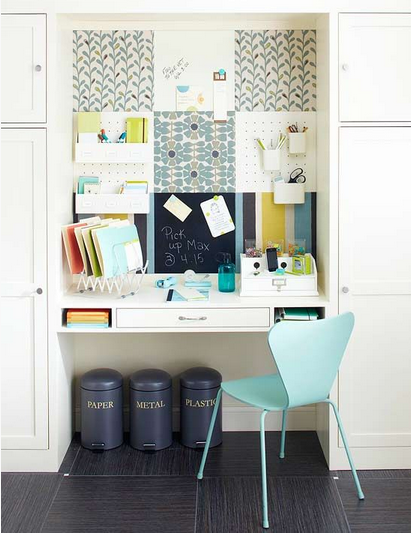 We love how neat and tidy this home office space is. Something like this could work well even in an apartment or other small space. For the record, it’s totally cool if you just have one trashcan. 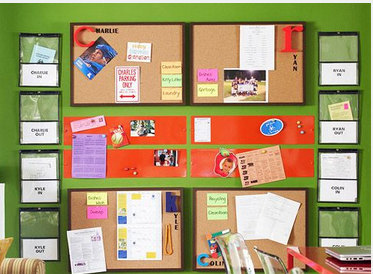 This area makes great use of wall space and the folders are great for holding bills of different types. The fact that they are see-through also makes them a little more approachable and could cut down on some of the frustration when you need to go looking and digging for something in particular. This is important for two reasons. First, it allows you to put all of your important information in one place. Having interest rates, minimum payments, and total balances altogether will be an important first step in setting up either the ladder or snowball repayment plans. As you adjust the numbers each month, it will also help you see your progress. The second reason why this is important is actually rather simple—it will give you a visual representation of where you stand. We all look at things differently and find motivation from different sources. For some, having a constant visual reminder could be an extremely important part of your repayment. You can monitor your progress each month, print out the table and put it on your refrigerator, etc. You want to soak up as much encouragement and positive energy as possible on your path to becoming debt-free. Communication sounds “abstract” but it’s actually one of the most important steps on the road to becoming debt-free. If you have a family or partner, you need to realize that your journey to becoming debt-free will involve them too. While they will probably benefit in the end, they might not be ready for the changes coming to your lifestyle. For instance, maybe your kids are used to going out to eat multiple times each week, but you have decided to cut that cost as part of your strategy. You will need to communicate the new expectations. Also, dealing with a spouse or partner is its own unique challenge. You will need to work together to determine each other’s financial strengths and weaknesses. You will also want to avoid conflict and disagreement, so make the debt-free goal and journey something you can share. It’s not only your family that needs your communication. You also will want to stay in close contact with your creditors during this time. If you experience any drastic change to your financial situation, such as a job loss, reduced income, relocation, serious injury, etc. you need to explain this to your creditor immediately. Doing so could allow you to modify your repayment terms temporarily, so that your credit doesn’t take a hit. There are hardship programs, workout options, and other such possibilities for consumers facing these types of situations. The key is to communicate, because unless you speak up you will be expected to pay in full and on time. And, failure to do so will put you in risk of being reported to the credit bureaus. You don’t want “debt-free” to be a temporary label. Instead, you want it to be a new lifestyle that you carry into the future. For this to work, you need to make sure that the principles you use to pay off your debt aren’t just quick fixes. It’s a lot like studying for a test in school. If you just cram, you might get an A on the quiz, but when you need to answer questions about the topic in a few weeks, you will be clueless. As you are repaying your debt, you will want to really involve yourself in the spirit behind what you are doing. Take a close look and spend a lot of time thinking about the way your money flows in and out each month, and look for consistent ways to save. You need to create a routine and habits that you can implement on a daily basis. You will also need to reward yourself for your hard work along the way to the point that even rewards can become routine. By taking this approach, you will form lasting habits that you enjoy and you will become even more involved in living a life of financial stability. This is not just the key to becoming debt-free. It’s the key to staying debt-free. Whether you have significant credit card debt or just a house payment, we hope you can put these simple strategies to work for you. Every day, we help clients create plans for their debt, and we are proud to say that many of them go on to live successful, debt-free lives. We know you can do it too. Best of luck, and please don’t hesitate to get started with credit counseling, if you are struggling with your current level of debt. Our program can help. We offer expert counselors and unique benefits.